← Can I Sell a Car That Was Submerged in Water? Forces of nature cannot always be stopped. In times of inclement weather, like heavy storms or wind, trees are prone to toppling over. Factors like root strength, soil conditions, and overall tree health can render a tree more susceptible to storm damage. Primary targets for falling trees are porches, decks, sheds, houses, garages, and of course, vehicles. 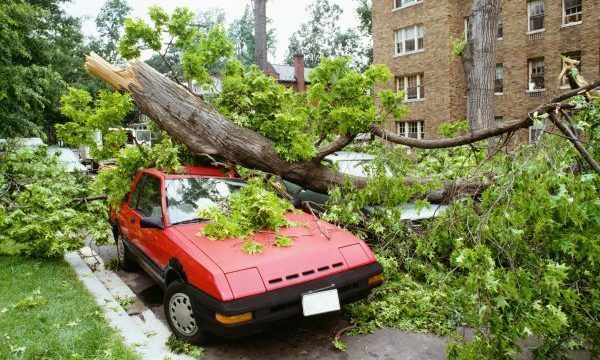 In fact, a large number of car insurance claims are for vehicles damaged by fallen trees. So what do you do if you walk outside, only to find that your car or truck has been squashed by a tree? Continue reading to find out. If you are a car owner, you likely have automotive insurance. In the circumstance that your vehicle is damaged, whether by tree or by something else, your first step is to contact your auto insurance carrier. They will take down your information and schedule a time for an adjuster to come out and look at your tree. After receiving a settlement offer from your insurance company, you have two options: You can make a claim with your insurance carrier and accept the insurance money, or you can keep your totaled car and forgo making a claim for insurance money. In the case that the vehicle is still driveable, you can have it inspected by a licensed mechanic to determine how much it would cost to have it repaired. However, even if it is still operational, it could still be considered a total loss if the cost to make all the repairs exceeds the current market value of the vehicle. If you decide that you do not want to release your totaled vehicle to your insurance company, you can choose to keep it, and later sell it to an Indianapolis junk car buyer, or dismantle it for parts. A junk car buyer will give you top dollar for your totaled vehicle, so long as you do business with a reputable and experienced company. These companies can also offer you free services, like pickup and haul away, estimates, and more. Call GC’s Junk Cars at 317-608-2188 to sell a totaled car for cash in Indianapolis. We offer free towing with our in-house tow truck, so all you have to do is call and accept our offer! We will schedule a time to pick up your vehicle and pay you cash. Request a free estimate, today! This entry was posted in Junk Car Buyers and tagged Indianapolis junk car buyer, sell a totaled car, tree damage car, tree fell on car, tree totaled my car. Bookmark the permalink.